What excites Alejandro Badolato Martín is the ability to prevent accidents on the roads. One million people die on the roads annually worldwide. In an exclusive interview with CompassList, the co-founder of Autodrive Solutions explains how the startup's radar detection technology can be used to reduce different types of accidents. The inspiration to make autonomous driving safer came from Badolato's research at the Polytechnic University of Madrid's School of Telecommunications. He was part of a microwave and radar group that was developing very high-frequency radars of about 300 GHz to detect weapons or explosives under the clothes of targets located at distances of 8–20 m.
By 2050, the autonomous automobile market alone is predicted to be worth US$7 trillion, a figure that depends on vital road safety improvements. Badolato saw the potential of the high-precision detection radars and came up with the idea of using them to read information encoded in transportation infrastructure. In 2015, Badolato and his civil engineer friend, Jesús Antonio del Castillo Igareda, co-founded Autodrive Solutions to develop radar positioning systems (RPS), specializing in autonomous driving, railways and smart city infrastructure. Badolato tells CompassList about the company's plans to become a key provider of traffic management services in the smart cities of the future. This interview was conducted in Spanish and translated by CompassList. It has been condensed and edited for clarity. Q. What inspired you to set up Autodrive Solutions? A. Speaking from the heart, what excites me is being able to avoid accidents on the roads. I'm convinced that our technology will solve that problem and that in the end, it'll be used in many places. In the United States, 40,000 people die on the roads each year. The annual death toll in Europe on roads is 26,000 with an additional 35,000 injured. This implies an expenditure of €2 billion in healthcare for the accident victims, almost 1.5% of the European GDP – and the figures tend to increase with the use of mobile phones while driving. In the world, one million people die every year on the roads. It's the greatest "war" we've had in history. Our technology can also increase the autonomy of the electric and hybrid vehicles and reduce the weight of their batteries. For railways, trams and subways, our technology can increase traffic line capacity and even prevent suicides in subway stations. Energy consumption and pollution will also be reduced. Our company seeks to find solutions in road infrastructure and solve the problems of autonomous driving. The way to monetize our radar positioning system (RPS) technology is still to be determined because it depends on the decisions of the other parties. It's an area where we don't have much bargaining power. We'll demonstrate the viability and benefits of our systems and hope to be recommended for projects by the relevant authorities. We are in close conversation with high-level authorities, including the European Commission's Directorate-General for Mobility and Transport (DG Move) and the Federal Highway Administration, to test our technology in real scenarios. The Bombardier vehicle is an example of the railway and road transport sector-specific projects. The Bombardier is a train that circulates on asphalt with wheels and tires. For such projects, we'll provide a customized service where the client pays for the execution and/or maintenance of the service with quality controls. Please explain your products and services for road transport and railways. The most developed market is the railway sector which is much closer to us. Major players like Siemens, Alstom, Thales and Bombardier control this market. It is a barrier to entry, but it's much easier to convince an operator to use our technology than to convince the UN, the Federal Highway Administration or the EU to do so. However, there's more interest in the road transport area due to the difficulties that autonomous cars are encountering. There are also potential projects relating to the train and the car sectors, like automotive people movers (APM) with their autonomous trains using wheels and tires to run on concrete. Automatic guided vehicles (AGV), for example, are used within factory sites. The company is also developing sensors that can easily be placed on the underbody of vehicles to monitor their speed and travel routes. We are finalizing the tests of our first sensor in real environments. These sensors can be used for trains, as well as to improve the basic railway infrastructure of emerging markets like India and Africa. What are the milestones of Autodrive Solutions since it was established in 2015? The startup was incorporated with an initial capital of €6,000. Additional funding of €200,000 came from family members and friends. We started work on the project in September 2015. The company's assets were valued at €960,000 in 2018. We were named the best company from the Polytechnic University of Madrid in 2016 and made it to the finals of the LA Mobility Challenge. We were selected for a NEOTEC research project with funding of €180,000. We also received €750,000 by CAF SIGNALLING, as part of its €18-million project for a new metro automatic signaling system in Madrid, to facilitate an adaptive braking system for trains. We have also presented our technology and various solutions to the UN, including a platooning technology to increase the autonomous capacity of electric truck convoys. Platooning is a solution for a line of trucks where a leading truck guides the convoy. The rest of the vehicles can either have a driver or be driverless. Our solution allows unlimited autonomy with small electric batteries. Finally, we've been appointed transport experts at the UN and the European Commission. The latter has designated us as experts for the investigation of transport strategy in the EU from 2030 to 2050. We recommended the use of special 3D plastic paint for road marking to increase the accuracy of the guidance systems for vehicles. The Commission's DG Move has informed us that it's interested in carrying out a pilot project with our technology. What are the objectives and long-term plans for Autodrive Solutions? Our first objective in 2019 is to be a profitable company, with sales and customers who pay for their services. In this sense, we already have several projects in the pipeline. The project with Bombardier transportations, subject to an NDA and pending confirmation, will be for a new generation of APM like the autonomous last-mile vehicles to replace the mechanical system with our technology. Another is with the Spanish General Directorate of Traffic to establish an autonomous bus at the Autonomous University of Madrid for a 2-km journey. There's also one with Iberia to automate the bus that connects the carpark to Terminal 4 of Barajas Airport. We hope our RPS system will become the standard in the world when autonomous driving becomes a daily reality. Mobility in the cities will then have to be supervised or managed by a central computer 95% of the time due to the need to synchronize traffic flows, prioritize public transport, make way for emergencies, or select the optimal route for cars. By displaying our technology in the cities, we can provide traffic management services in the smart cities of the future. Let's see how far we go! Could you tell us about yourself and co-founder Jesús Antonio del Castillo Igareda? Jesús Antonio del Castillo Igareda and I run the company as joint CEOs. We've known each other since we were 15 years old. He's a civil engineer and has a lot of experience in the business world. He has managed four or five companies and was in charge of Sacyr, the well-known Spanish construction and infrastructure company, in Libya. He has experience of supervising 1,200 employees and projects worth €800 million for Sacyr. I stopped studying and started working at the age of 18. I was a lighthouse telecontrol and maritime signaling installer for a telecoms company. Ten years later, I studied telecommunications and became a telecoms engineer. I finished my PhD and in 2015, I worked as a researcher at the Polytechnic University of Madrid's School of Telecommunications. In the microwave and radar group, we worked with very high-frequency radars of about 300 GHz and used them to detect weapons or explosives under the clothes of targets at distances of 8–20 m. We used 3D technology to reconstruct the skin of the targets. Such radars can measure very precisely by concentrating a lot of energy on a specific point to detect all kinds of materials very rapidly. I came up with the idea of using them to read information encoded in various types of infrastructure. What are the main challenges? Do you have any competitors? The challenges are more related to entrepreneurship like funding or getting research projects approved. We're introducing new technology in an established market that is dominated by giants like Siemens, CAF, Indra, Alstom, Volkswagen and Google. We don't have direct competitors with similar technology. 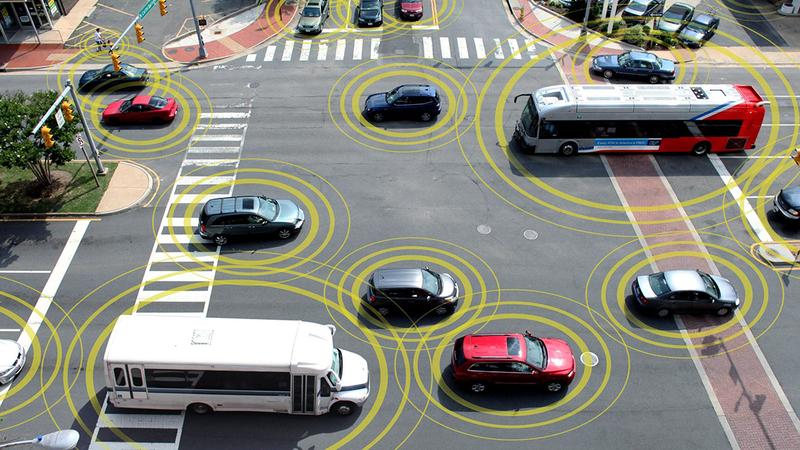 What we're doing is applying the existing technology to the mobility and transport sectors. Our solutions are based on the millimeter-wave radar technology. When I started my PhD, a radar with these features could cost €20,000. Today a similar radar costs only €30. All the technology has been integrated into a single silicon chip. The way to reach high frequencies of up to 100–300 GHz has been greatly simplified. Our low-cost RPS system is safe and reliable. It can locate a train with an accuracy of just 1 cm and a vehicle orientation within one degree or less. Installed on the underbody of the vehicles, the radar sensors can measure every centimeter between the sensors and the ground very quickly and accurately to obtain a highly detailed ground profile of a moving vehicle, with just 0.1-mm error margin. We expect to secure sales of our railway products soon. For the railway sector, we are targeting the operators themselves like the metro and other passenger transport companies. We'll also approach signaling manufacturers like Bombardier, Siemens, Thales and Alstom. Bombardier, Siemens, CAF SIGNALING and Deutsche Bahn have already asked for the equipment to test our technology. Our solutions are price competitive and are 100 times more accurate than the current systems – and they also work in the snow! What we don't know is how much time these operators need to implement it. Our guidance system for APMs or AGVs could be on the market within a year. We've already signed a contract with Bombardier and we also hope the European Commission will finance a pilot project soon. For road transport, our customers can be the manufacturers of AGVs or robots that circulate through ports, airports or factories. Our guidance systems are also suitable for companies like Navia or Transtech that have last-mile vehicles, such as buses that run at very low speed between two points in poor traffic conditions. These operators want to stop vehicles very precisely at stations. Their current systems using GPS, lidar or precision maps have a maximum error of 20 cm, and they need a precision of five. We can give them an even better precision of just 1 cm, even if only for the last 10 m to the station. We'll also explore the emerging markets in Africa and India where many trains don't have any kind of security or signaling system due to the very high costs. The equipment also cannot be displayed because these will be stolen. Our technology is 20 times cheaper than the traditional systems. It can be used as an initial security system to give accurate locations of a train, monitor its speed and report its position at all times, without touching any of the existing infrastructure. Sensors can simply be hidden on the underbody of the vehicle. We're now finalizing the tests of our first sensors in real environments. How does the RPS road solution work? Our technology can solve the main problem for Autonomous Driving System (ADS) level 3. When a vehicle travels very fast at 100 km/h, it travels 33 m/sec. The equipment of a driverless car, such as video and optical cameras, will use road markings to detect the vehicle's position on the road during the journey. But the readings may be inaccurate because the ground is wet, the sun is interfering with the equipment, or the road markings are not well maintained. Studies demonstrate that in conventional cars, the driver who's not paying attention takes 6–45 seconds to react properly. Therefore, an accident can occur within the six seconds when the vehicle has a perception problem. To solve this issue, Autodrive Solutions uses 3D-plastic paint markings to encode information along the road. They are similar to the ones used on many European roads to improve the visibility of road markings in bad weather conditions. Our sensors are then placed on the vehicles to read the codes stored in the road infrastructure, like the 3D-plastic road markings, to determine the precise position of each vehicle within an error margin of just 1 cm. Volvo previously proposed a similar solution, with neodymium magnets, which was discarded because of the high cost. Our solution, using "paint drops" of the 3D plastic on the road markings, will be cheaper at €200 per km. This can be done very quickly and is virtually maintenance-free, lasting for over 15 years. The 3D-plastic paint is dropped at 16 km/h, so 50 trucks could paint all major roads, secondary roads and Europe's highways in less than three years. In addition, we also have the technology that can guide the vehicle for 200 m safely based on the wheel spin information and the steering wheel orientation. For example, if the 3-D plastic paint was removed or uneven, or the system was damaged, it's possible to continue to steer the car safely because the map of the road and the vehicle movements will still be stored in system's memory. That crucial 200 m can be used to reduce the speed of the car and give the human driver inside the vehicle more response time to take over the controls. How will your solutions work in the railway sector? Our first product for the railway sector is a system to measure the speed of the train. We use two radars separated at the same distance from the line. Each radar records very detailed information about the profile of the ground like the stones, ballast and sleepers. Based on the two profiles obtained, a temporal correlation is produced by moving one profile with respect to the other to see how long it takes for the first sensor to reach the position of the second. From that, it's possible to determine how long it'll take the second sensor to reach the position of the first, thus calculating the travel speed more accurately. The current systems are 1% cumulative, which means for every 5 km there's an error margin of 200 m. Our solutions are about 100 times more accurate. An example is the accident that occurred in Santiago de Compostela, where a train traveling at 160 km/h entered a bend designed for 80 km/h. Once we have the train speed, we'll store the ground profile as a signature in the train's system memory. The next time the same train passes over the same infrastructure, the new scanned profile is compared with the one stored in the memory to match and estimate the train's correct positioning to navigate the bend safely. If we want to stop a train in a precise way, the ground signature is increased by inserting plastic tags on the rail sleepers with encoded information associated with the different thickness of the plastic. By deploying a plastic encoded ruler along the entire station, the radar can identify at which centimeter of the ruler the train is located at all times. Therefore, our RPS solution will permit an adaptive braking of the train. Today’s systems have a variable error margin of 0.5 m depending on the type of braking curves.